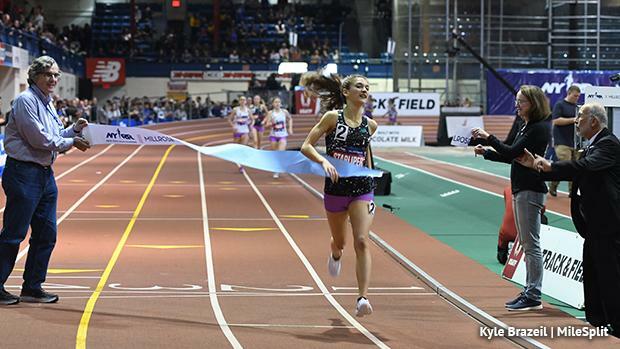 A pair of Pennsylvania girls earned convincing wins at the 112th Millrose Games at the Armory in New York, and both walked away with state records in what was a great day for Keystone Staters at arguably the most prestigious indoor meet in the country. Freshman sensation Fore Abinusawa won the 60 meters in 7.33, tying the all-time PA state time, while in the mile, Marlee Starliper broke the state and meet record to dominate the field. Here are some Millrose highlights. Fore Abinusawa of Germantown Academy placed herself squarely in the national spotlight and in the Pennsylvania history books with a blazing fast performance in the 60 meter dash. The freshman (yes, freshman) rolled to the Millrose title in a 7.33, tying Thelma Davies' Pennsylvania state record, which she set a year ago at New Balance Nationals Indoor. Abinusawa was .34 clear of second place, making Saturday's victory a rather dominating one. It's a current US#2, trailing only sophomore (and freshman class 60m record holder) Tamari Davis of Florida. Meanwhile, a little later in the day, Davies, whose record Abinusawa tied was going up against the pros. The Girard College senior and LSU recruit won the last two Junior Girls 55 meter dash titles, so she tried a new challenge in an elite field. Davies, out of lane one, went 7.45 for seventh place. That is just .01 off her season best in the event. Marlee Starliper continued her red-hot winter on Saturday, claiming one of her career's trademark wins in the Junior Girls Mile. The Northern junior, who was third a year ago, went 4:41.66 to break the PA state and Millrose meet record. The field was without its pre-race favorite, Katelyn Tuohy, who scratched because of a reported illness. Then the race was delay due to an emergency on the track with a runner in the Men's 3,000 meters. Still, Starliper was ready to seize the opportunity. She took the lead on the second lap and cranked out 35 second laps, gradually pulling away from the field. She closed her last two laps with 33 second splits to finish just ahead of Kate Murphy's meet record, which stook at 4:41.84. Starliper also broke the PA state record, formerly held by Brianna Schwartz in 2014 (4:42.58). It's a current US#2, trailing only Tuohy's nation-leading 4:39.15 from earlier this season. Saturday's performance is yet another big time from Starliper, who shattered the 3K state record earlier this winter at Penn State. It was a big meet for PA runners even after Starliper. Taryn Parks of Greencastle-Antrim placed third and posted an indoor PR of 4:46.34, a PA#2 and US#4 performance. Germantown Academy's Isabelle Goldstein was fifth in 4:49.20, also a PR, as well as a PA#3 and US#7. Academy of Notre Dame's Jessica Schneider was seventh in a strong 4:52.35. On Thursday night, Scranton Preparatory's Victoria Atkinson won the Junior Girls Pole Vault, clearing 12-05.5, a PA#4 vault. Neumann Goretti took third in the Girls 4x800-meter relay, running a time of 9:09.06. That's a PA#1 and US#3 time, trailing only the top two teams from the Millrose race. Strath Haven, the defending champions, were fifth in 9:18.49, improving on their own PA#1. The Central Dauphin East boys took second in the 4x200-meter relay. The state leaders clocked a time of 1:28.52, which improves on the squad's own PA#1 and moves them up to US#5 on the season. All three PA entries in the Junior Elite Girls Pole Vault on Saturday jumped 12-09.5. Arkansas's Edie Murray won with a 13-05.25. On attempts, Manheim Township's Sydney Horn was fifth, while State College's Lyndsey Reed was sixth and Germantown Academy's Liliana Cohen was ninth. In the Junior Girls 300 meters, Sanaa Hebron of George School took third overall, bettering her own PA#1 with a time of 38.75. Tia Taylor of Saint Basil Academy placed fourth in the Junior Girls Long Jump, leaping 18-03.25, her third jump of the season over 18 feet.